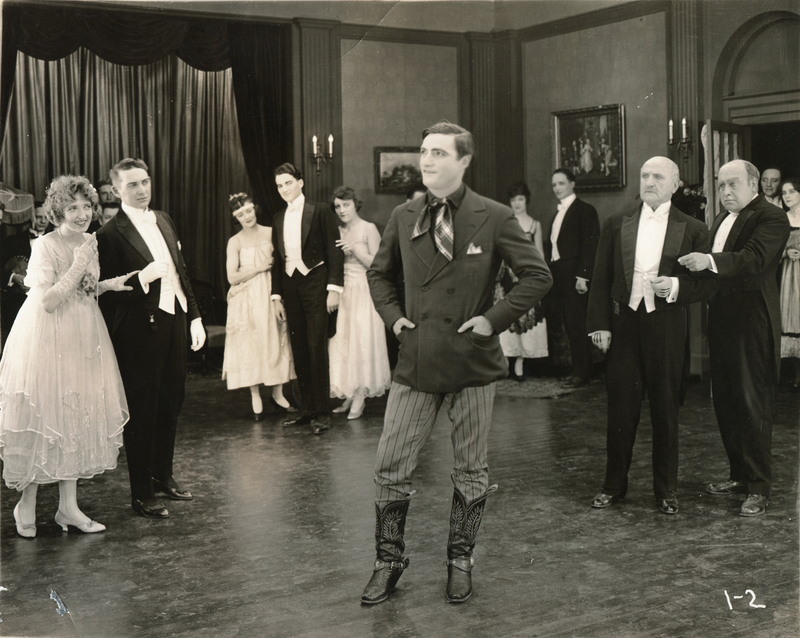 Tom Mix in "Western Blood"
Tom Mix stars in the 1918 Fox feature, "Western Blood," which was shot in the Santa Clarita Valley (although the pictured scene obviously wasn't). 8x10 glossy production still. No, your vision isn't failing you; Tom's boots are in focus but his face isn't. Stamp on the back of the photograph reads: "William Fox presents / Tom Mix / in Western Blood / Written and Staged by Lynn Reynolds / Fox Film Corporation." Tom's leading lady in this film is Victoria Forde. According to Birchard (1993), the two were paired in several Fox shorts, but this was the only time Forde co-starred with Mix in a full-length Fox feature. "Western Blood" was released April 14, 1918; Tom (1880-1940) and Victoria (1896–1964) were married less than a month later, on May 5, Tom having divorced his third wife, Olive Stokes, in 1917. Tom and Victoria's marriage produced a child and ended in divorce Jan. 4, 1932. The following month, on Feb. 15, 1932, Tom wed for the fifth and final time. Mabel Hubbell Ward became his widow when he died in a 1940 car crash. Additional credited cast members in "Western Blood" include Barney Furey, Frank Clark, Pat Chrisman and a fairly young Buck Jones, who was credited as Buck Gebhart (Jones' birth name was Charles Frederick Gebhart). LW2496: 19200 dpi jpeg from original photograph purchased 2013 by Leon Worden.